Every Monday I post a photo that is meant to inspire you, motivate you, cause you to pause and ponder, remind you of your dreams and hopefully entice you to act on whatever your goals may be. This Monday, June 4th takes us to a location along the main road from Denpasar to Besakih Temple in Bali Indonesia. It’s a beautiful placed called Bukit Jambul. Bukit (hill) Jambul (tuft of hair) apparently got it’s name from the trees at the Hindu Temple called Pura Pucak Sari on the top of a nearby hill which look like “tufts of hair”. It offers a great panoramic view of rice terraces, coconut groves and the ocean. 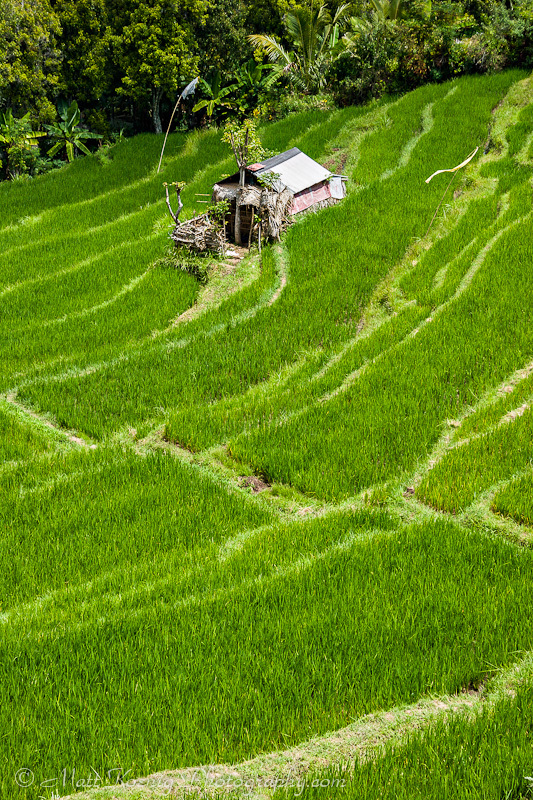 With this photo I wanted to concentrate on the incredibly bright green rice fields broken up by the diagonal lines made by walkways and the leading edge of the terraces. I have made a 20X30″ print of this image and it looks absolutely incredible. If you are ever in Bali make sure and stop and take in the view. The first thing that struck me was the lines and then the vibrancy of the green. Nice work. Ayngelina recently posted..Have you met Bruce? Thanks Ayngelina. Bali has many scenes like this with lots of bright vibrant greens. Something about these rice fields that is just very peaceful. Can’t wait to go back.